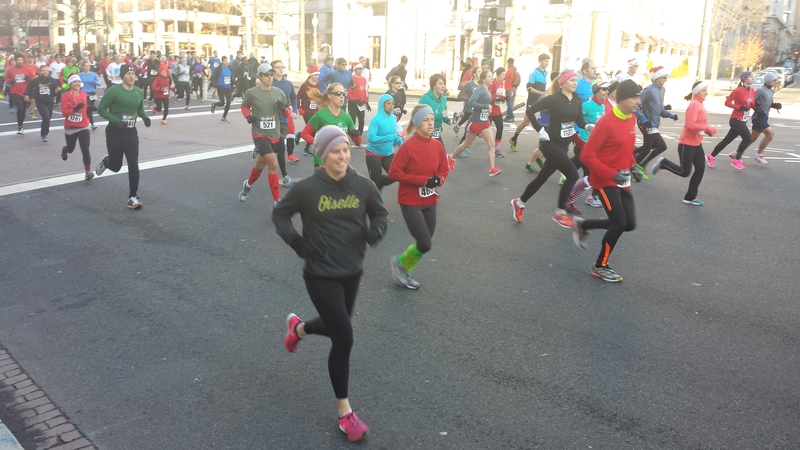 A few weeks ago I ran the Jingle All The Way 5k put on by Pacers right in the heart of DC. Initially slated to be an 8k like last year, road construction turned this year’s race into a 5k. One of the nicest things about Pacers races is you can generally pick your packet up earlier in the week at their various stores. I was able to grab mine at the Old Town store on my lunch break Thursday afternoon saving me time and hassle on race morning. I was looking forward to this race and had planned to run aggressively thinking I could finish around the 23 minute mark. That would not be the case as I came down with some cold/flu symptoms late in the week making it more of a survive and finish race. I spent most of Friday night and Saturday on the couch, but still wasn’t feeling great Sunday morning when we headed into DC for the race. On the plus side, Ian and I easily found a street parking spot just a few blocks from the start/finish line. 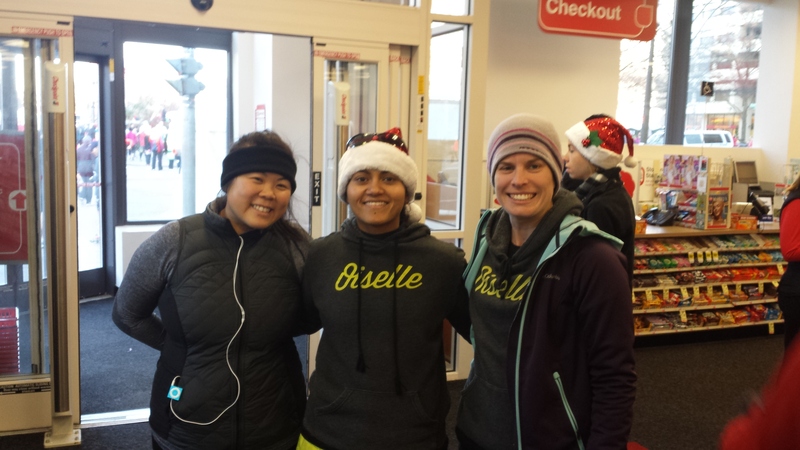 The highlight of the morning was meeting up with a few fellow Oiselle birds also running inside the CVS near the start. I unfortunately had to pass on post-race brunch with them after as I had no desire to share my germs with everyone! It was so freaking cold that morning. People who ran last year kept saying what a nice day it was because the sun was out and apparently last year was pretty miserable cold and snowy out, but that wasn’t making me feel any warmer. I finally ventured out of the warm CVS for a warm-up run, but couldn’t seem to get warm. I ran into Ian on my way back to the start line as he was finding a spot along the course and actually grabbed my hoodie back from him that I had planned to only wear pre and post-race. You could self-seed yourself at the start based on signs with different paces. I set up between the 7:30-8 minute pace areas trying to stay warm and stop coughing. Sorry everyone around me! From the start it was a strugglefest and not in the good I was pushing myself to new limits kind of way. My stomach felt off, my legs felt weak and I was gasping for breath like I was running a much faster pace. My time wasn’t what I had hoped before getting sick, but it wasn’t all that bad. I finished in 24:58, but just felt so awful doing it that I couldn’t really enjoy the race. The course itself was great. 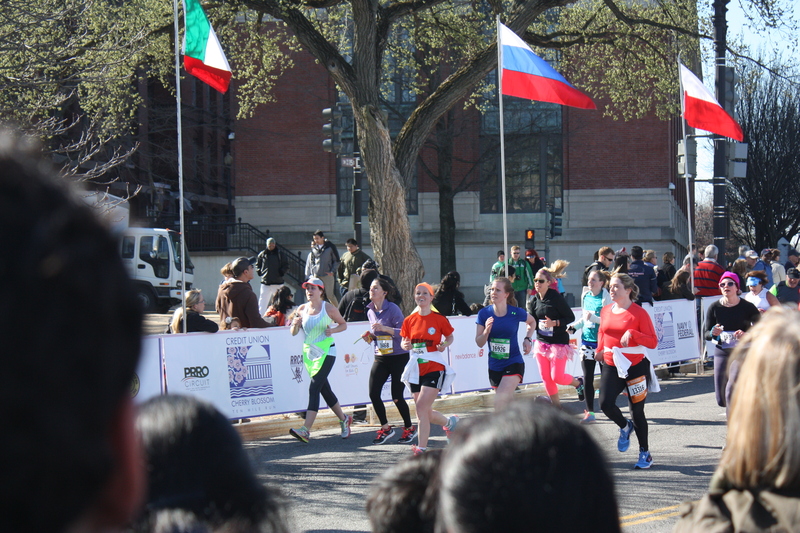 The start finish area was on Pennsylvania Ave just a few blocks from the White House. We took off running down Pennsylvania towards the Capitol Building, which we passed in front of before a quick out and back along Independence and a loop around some side streets. 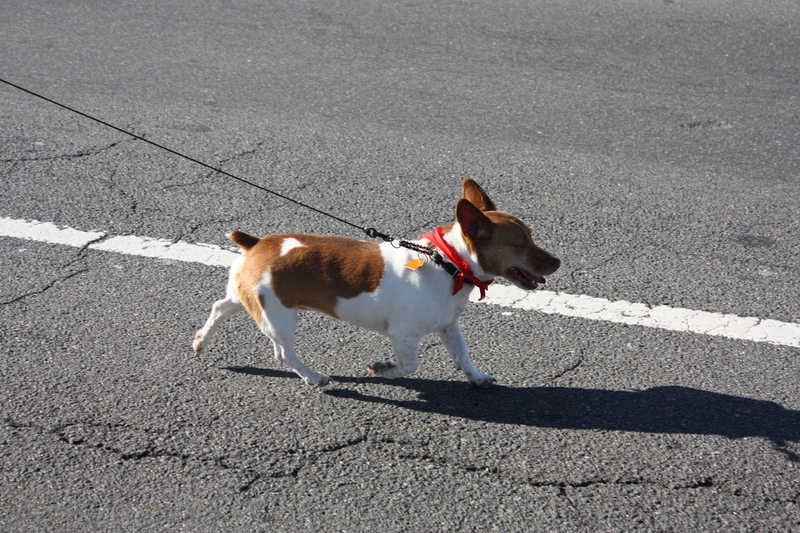 We crossed in front of the Capitol again – although much closer (I love running in this city!) – before heading back up Pennsylvania to the finish. I spotted Ian again along my way to the finish and tried to find some energy for a final kick. Boy was I glad to cross that line. 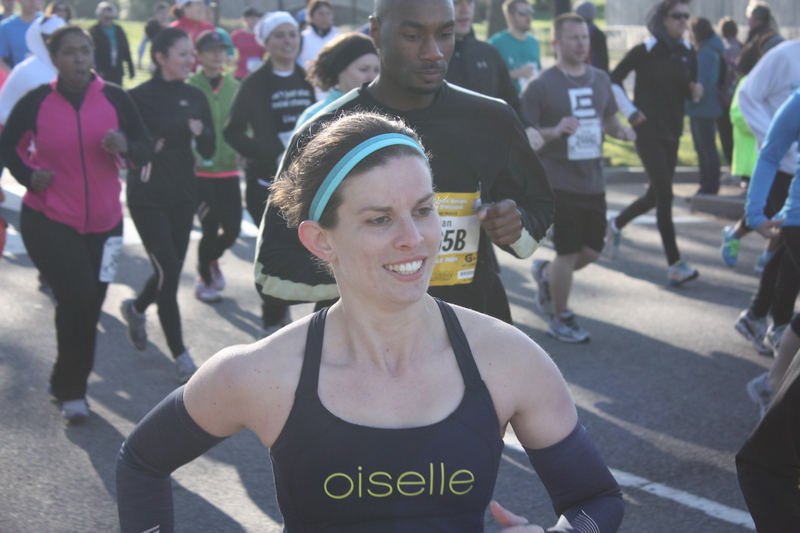 I got to cheer on a few more Oiselle teammates before we decided to make a break for the car and some heat! It wasn’t my day for sure, but still a great race. 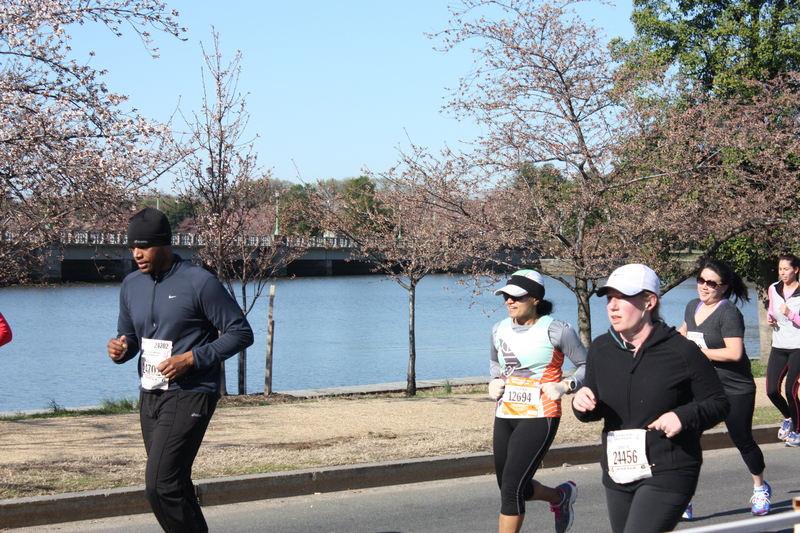 Pre-race packet pick-up was a breeze, the course was well marked and those views of DC are hard to beat. On top of that, there were a ton of runners in costume and many with jingle bells on their shoes making for a very festive atmosphere! 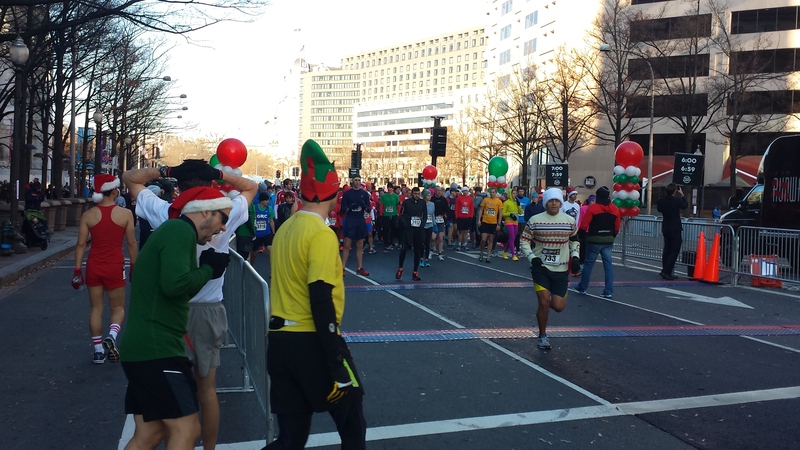 This is a fun, holiday race for those in the DC area – and hopefully next year will return to its 8k distance for an extra couple miles of jingling all the way! And just like that, week 2 of marathon training is done! Other than coming down with a cold at the end of the week it was a great week and I felt especially good about my first speed workout in a while. All told, I tallied just more than 40 miles last week. Monday: I got 6 miles in on a beautiful day before heading back to D.C.
Wednesday: I had a speed workout on tap for Wednesday that had me pretty nervous since I hadn’t done one in quite some time and knew this would be a true test of where I was at. I decided to start just after work and end at my apartment. I put in about a 2 mile warm-up before kicking off my 12 X 400 meter repeats with a 400 recovery jog between each, followed by a 2-mile cool down for a total of 10 miles. I set my Garmin up for the workout so I wouldn’t have to look at my watch at all and could just run by feel. This worked out great and when I checked my paces after the run I had kept each repeat between a 6:35 and 7-minute pace. Ideally I would have hit them all around the 6:35 pace, but given it was my first speed work in awhile and that it wasn’t a flat course, I felt really great about it. Thursday: After a tough speed day, I put in 6 easy miles along the Mt. Vernon Trail after work getting to bust out my head lamp and light-up vest for the second day in a row. Friday: The snooze button got the best of me Friday morning so it was another 6-miler post work. I was really starting to come down with a cold at this point so I almost bailed on the run, but it ended up feeling great! Saturday: I woke up feeling awful and it was 40’s and rainy so I knew the only way I was going to get my run in was if I went right away. If I let myself sit on the couch and start watching TV – it would not happen. Once I was out the door the rest just flowed and I put in a nice and easy 8.5 miles along the W&OD and Custis trails. I then promptly spent the rest of my day on the couch! 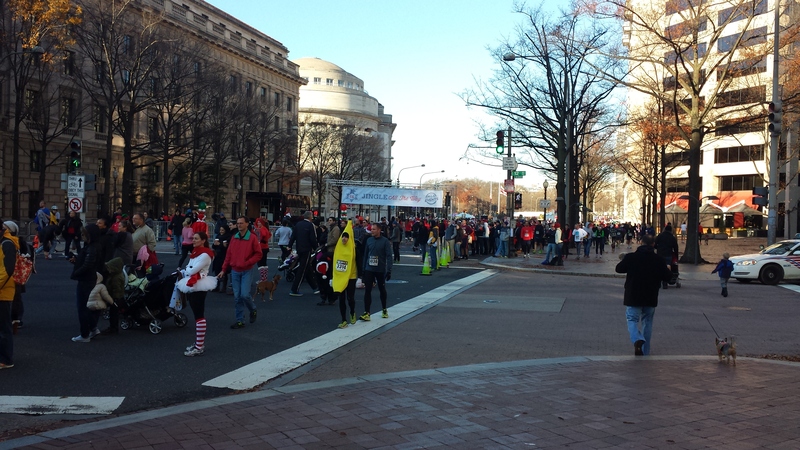 Sunday: I had the Jingle Bell 5k race in D.C. on tap for Sunday. It was a little slower than I hoped, but a pretty good effort. Full recap coming soon, but I crossed the line in 24:58. 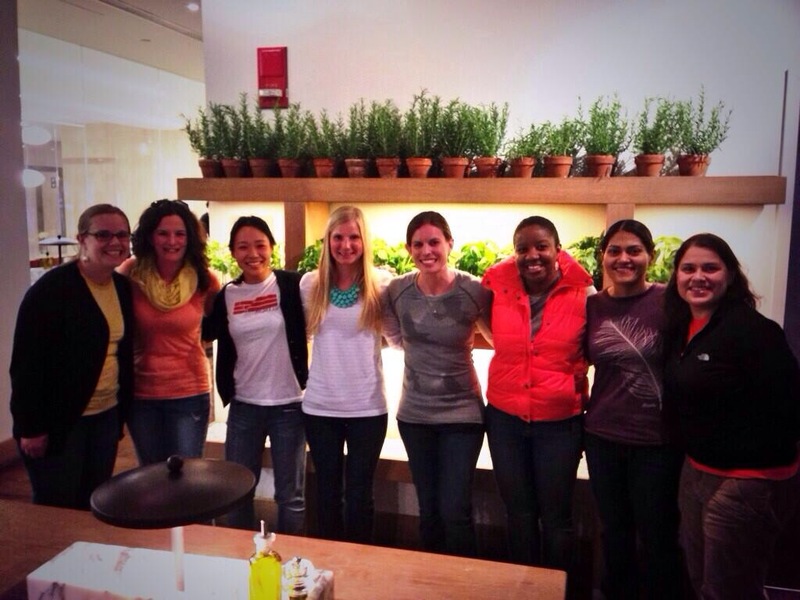 I also got to see and meet some fellow Oiselle Birds, which is always fun! 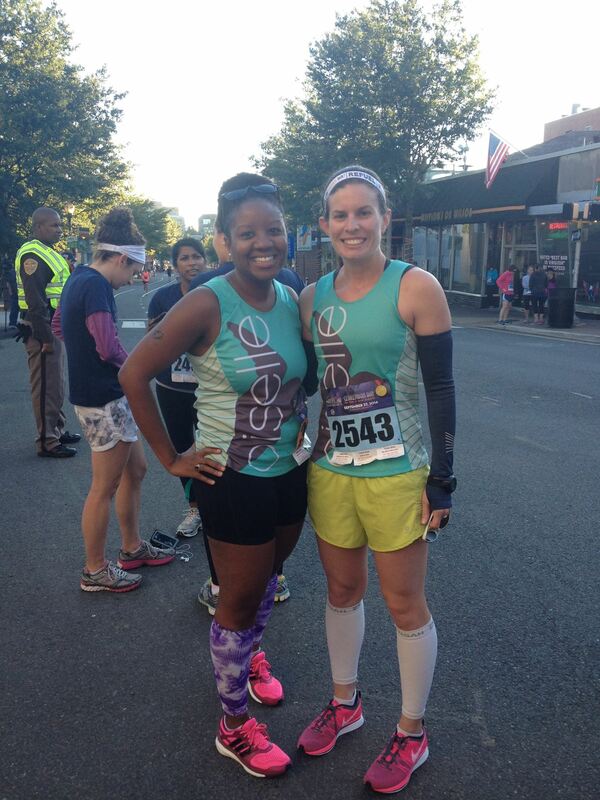 Time for another overdue race recap! 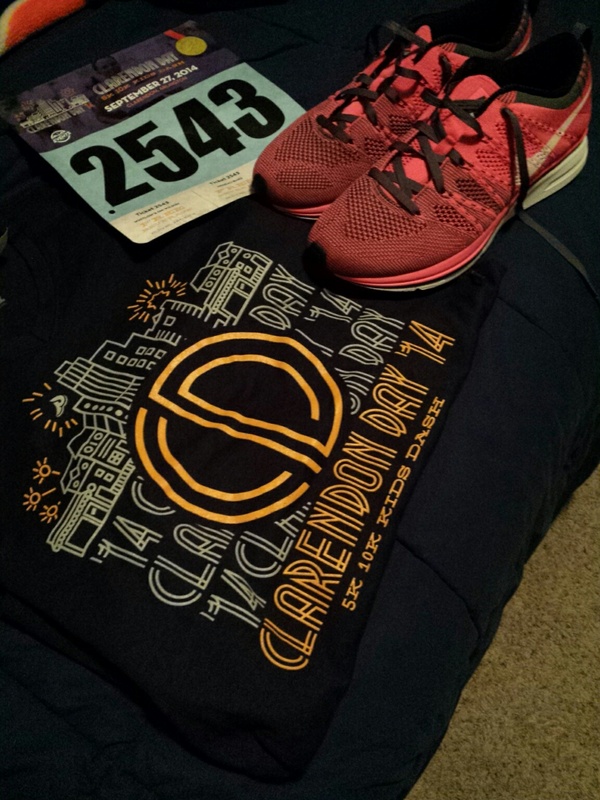 In September I ran the Clarendon Day 5k. You may remember last year I did the double at this race running both the 5k and the ensuing 10k. I have to say, I was pretty relieved this year when I was walking back up the hill after the 5k that I only had to cheer on the 10k runners and not join them this time! I love this course right in the middle of my old neighborhood. I’ve spent many early mornings running up the Wilson Boulevard hill, so I was really looking forward to getting to run down it for this race. 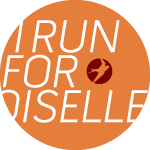 There were a lot of other Oiselle runners coming out for the race and for brunch after so it was great to see that crew as well and meet some of the newer flock members! I ran into a few before the race started and then hopped into the starting area. 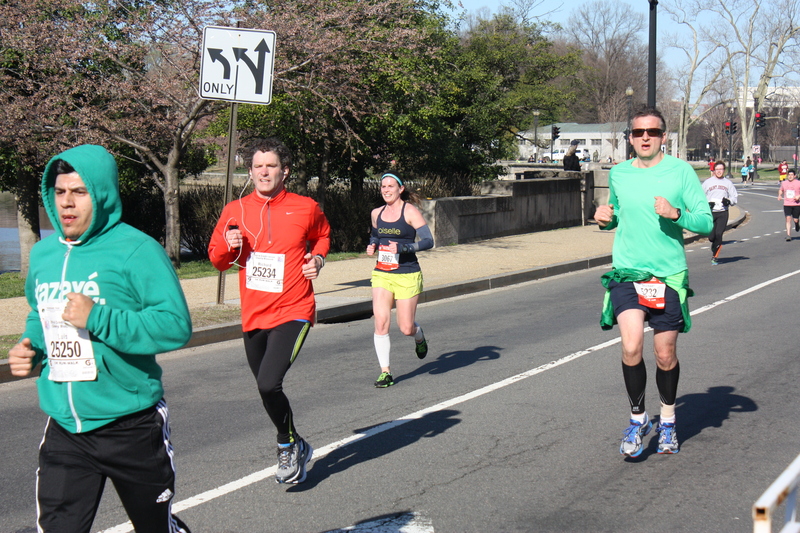 The first mile is fast and all downhill from Clarendon to Rosslyn. The second mile continues the downhill out onto route 110 straightaway towards the Pentagon before reaching the turnaround point. The final mile goes from flat to a slight uphill to the finish. After barreling downhill for the first two miles this hill seems way tougher than it should be! I crossed the line in 24:08 for a 7:46 pace. A bit slower than last year, but a bit faster than my run at the Dulles Day 5k the week before! I met up with some of my Oiselle teammates after the race as we walked back up the hill to cheer those doing both on at the start of the 10k. I changed out of my sweaty clothes and enjoyed a hot chocolate before we headed to brunch at Lyon Hall. Such a fun morning! 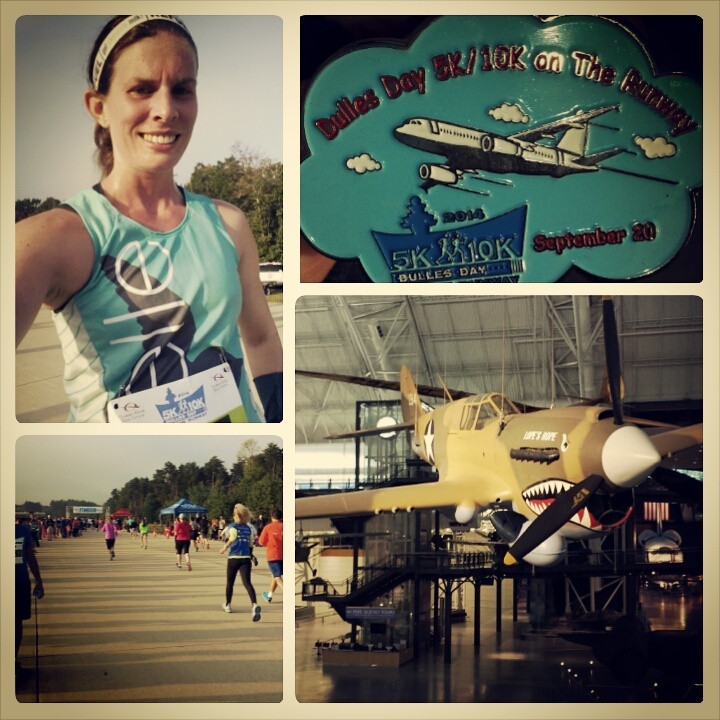 Last year I heard about a new race coming to DC – the Dulles Day 10k and 5k. It took place right on the runway – so cool! I was out of town for the race weekend though, so I wouldn’t get to do it. This past September, however, I would not miss out! My biggest regret is that I was not in better shape for this race. It is the ultimate flat PR course. It still turned out to be a cool experience though. Ian was out of town for the weekend, so I rented a car to make the early trip out to Dulles Airport on Saturday morning. The earliest public transportation could get me there was well after the race would have finished so that wasn’t an option. 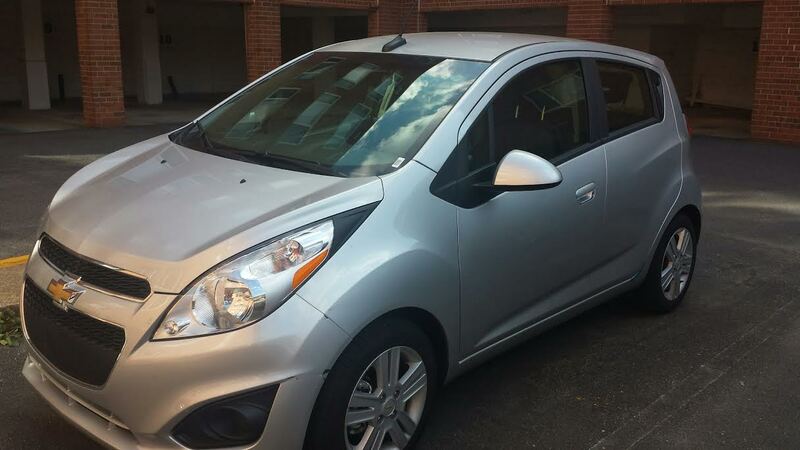 In a tiny Chevy Spark that was mine for the weekend, I made my way out to Dulles bright and early. Well, actually it was still dark. I needed to pick my packet up day-of so I got there an hour early thinking that would be plenty of time. It wasn’t. 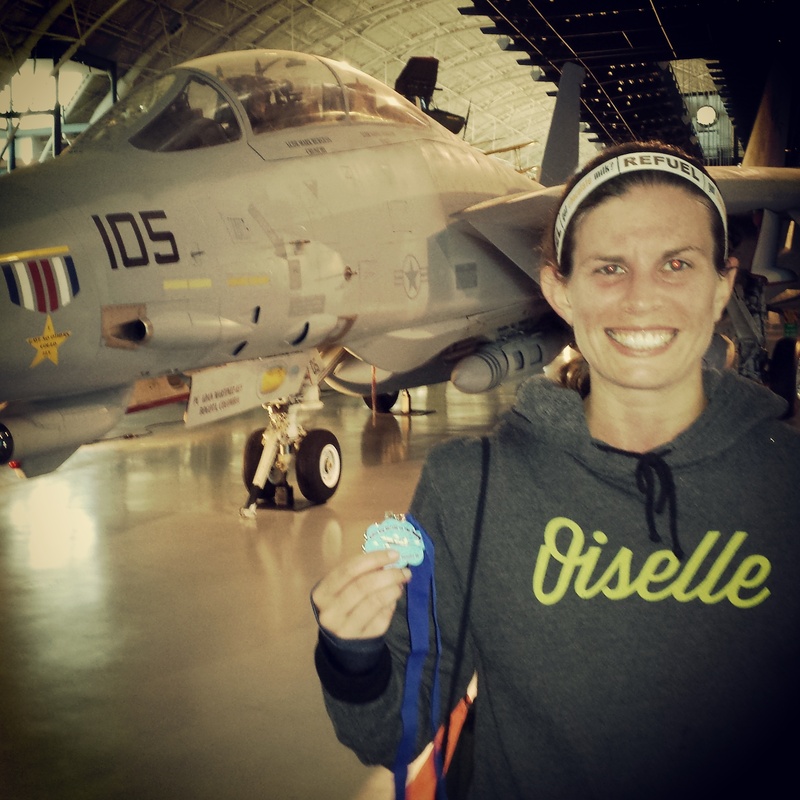 Parking for the race was at the Steven Udvar-Hazy Center – the companion museum to DC’s National Air & Space Museum. We got to cut through the museum to make our way to packet pick-up and the race start. I can’t believe I have never been out here before and now totally understand why everyone says it is so much better than the museum on the Mall. The packet pick-up line wound around in circles making it a bit disorganized and hard to find the end. Once I got my place in line it slowly chugged a long as I watched the time click down towards the start. I finally got my bib and then turned to see a line for the bag drop. I finally made my way to the front of that as they announced 3 minutes until the 5k start. I bolted off towards the start line and had to work my way up from the back of the field. I got about midway through when the race began. We made our way out onto the runway – talk about a flat course. There was one plane out along the way for us to run by before we shot down a straightaway. We made a slight turn and came back down the other side passing the start line and finishing back behind the Udvar-Hazy Center. The weather was perfect – a touch of chill in the air. 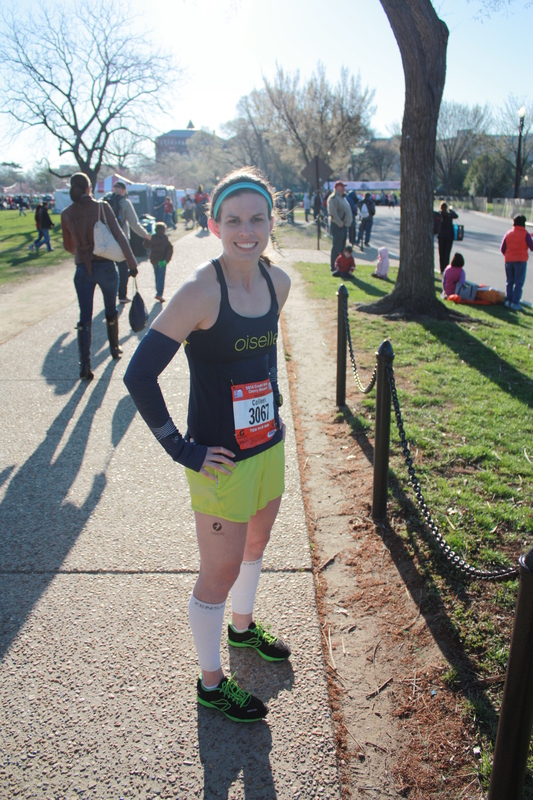 I wore my Oiselle arm warmers for most of the race before pushing them down for the last mile along with shorts. Still, I felt slow and flat-footed. 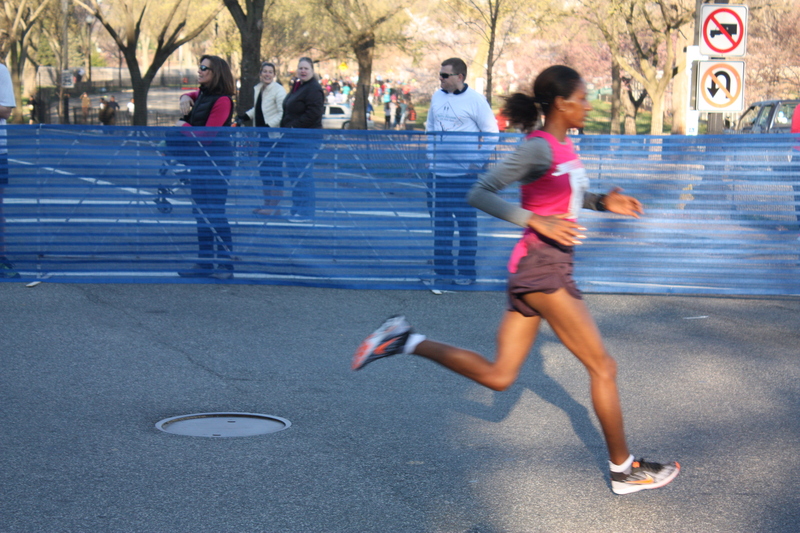 I wasn’t in shape and it showed in my time as I crossed the line in 26:12. That’s slower than my PR marathon pace! I did pick it up for the final mile, but wish that I’d had more to give. I did love the race though and will definitely go back next year if I’m in town. For you speedsters, the winners of the 10k get a pair of round-trip tickets from United and the top male and female 5k runners each get one round-trip ticket with United. Not a bad prize at all!! What unique races have you done? 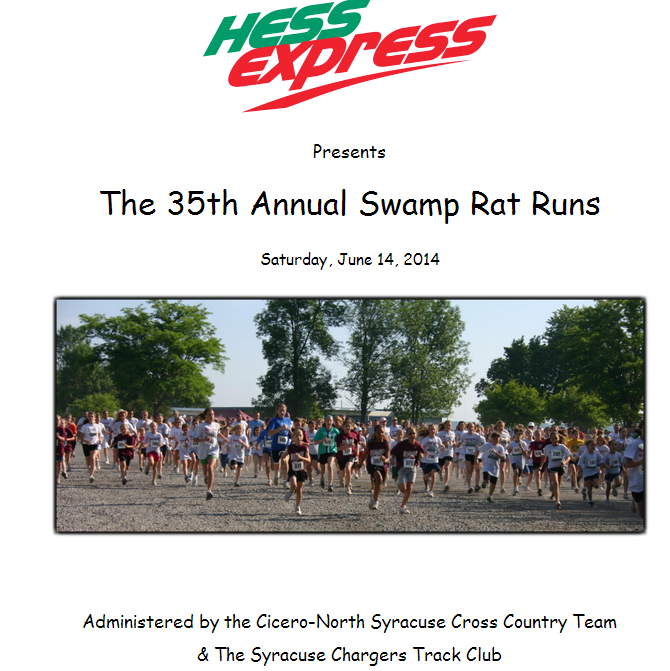 The first 5k race I ever ran (at least that I can remember) was the Swamp Rat Run in Cicero, New York. I was 17. My older brother Dan found out about it and asked if I wanted to run it with him. To say we were newbies is, well, a bit of an understatement. I remember stopping at a gas station on our way out that morning so Dan could get a red bull to pound before the race for extra energy. If only I knew then what I know now I could have advised him this was a bad idea! I lined up at the start line wearing a basketball practice pinny, shorts that came down to my knees and were likely not made of any kind of wicking fabric and…basketball sneakers (they were low tops if that makes it any better). I wish there were pictures. I can guarantee you that none of my ensemble was nearly as fashionable or functional as any of my Oiselle duds I race in now! Dan, who was always a pretty good sprinter, bolted off with the front-runners leaving me in his dust at the start. That red bull would come back to bite him though as I actually ended up passing him along the way to my 25-minute finish! I remember it was really hot out and I can vaguely picture the start/finish area, but the only clear memory I have of that race was how cool it felt to cross that finish line. The results were even published in the local paper the next day. I was hooked. This year that same race coincides with my bridal shower weekend, so I’ll be home in Syracuse for it. I know it’ll be a busy weekend, but I couldn’t resist and had to sign up. Thirteen years later at 30 years old, I’ll be back on the same start line where my love affair with racing began. 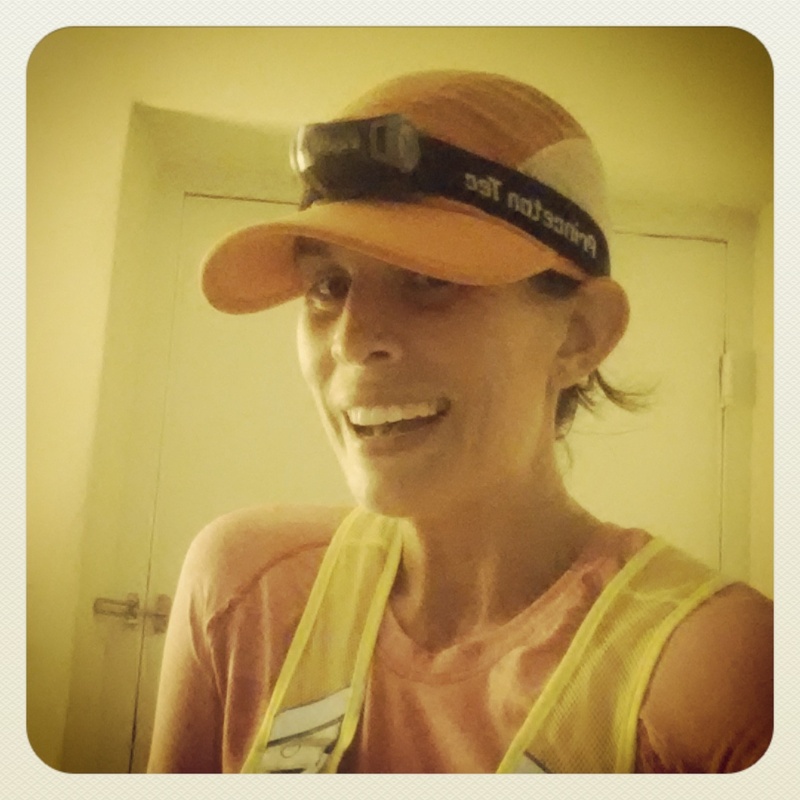 The race experience will probably be a bit different, but I am pretty sure about one thing – that I will get that same feeling of pure excitement and joy as I cross the finish line that I’ve gotten to enjoy time after time in the last 13 years of racing everything from 5ks to marathons! Do you remember your first race? Have you ever gone back and run it again? I’ve been slowly getting back into my running groove lately, but I have been running whatever I feel like and mixing in a lot of cross training with no real plan or purpose. Sometimes I like this, but I also tend to do a lot better when I’m on a plan – so I’m pretty excited to be getting myself back onto a training plan. This week I’m starting half marathon training. I haven’t made a final decision on which fall half I’ll do yet, but I’m looking at either the International Peace Half Marathon on the C&O Path in DC or the Navy Air Force Half, which I ran last year, also in DC. Both are the weekend of September 13th and I have a handful of shorter races planned along the way – more to come on that! The week ahead will be all easy runs ranging from 3 to 8 miles just working on base building! Thanks to a Facebook contest from my favorite running store, Pacers, I won a new pair of Saucony Kinvara 5s along with a new tank, Feeture’s running socks and a Sweaty Band headband! So exciting and I can’t wait to take the new shoes out for a spin tomorrow to kick off my training! 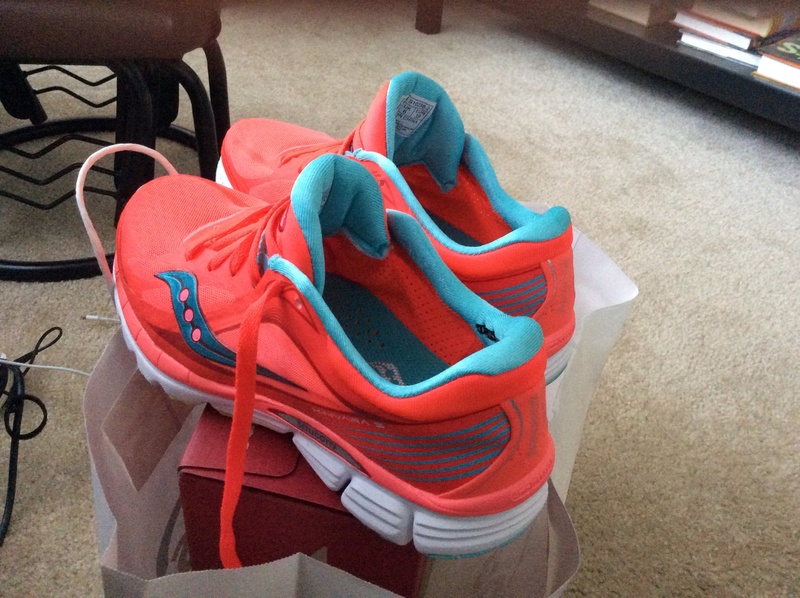 New Saucony Kinvaras courtesy of a Pacers Running Store contest! Do you like being on a plan or just running by how you feel each day? Does new gear motivate you to get out there an go?! 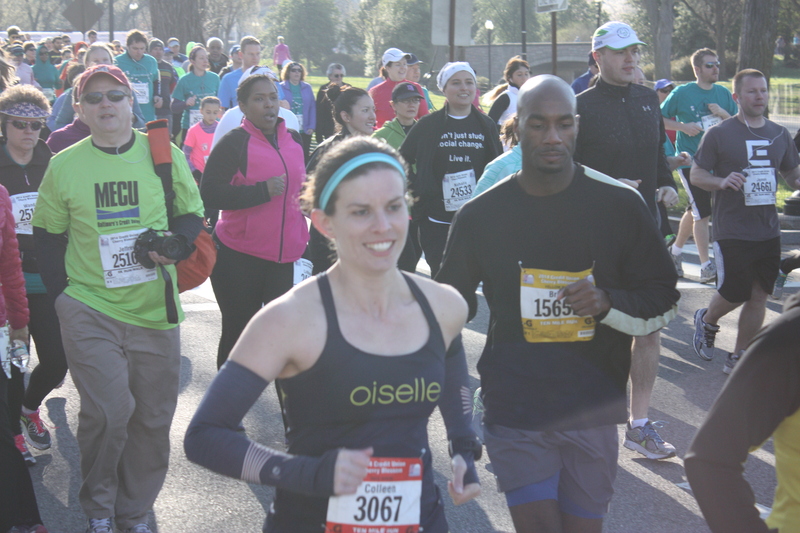 Tell me about your summer and fall race plans – any big goals coming up?